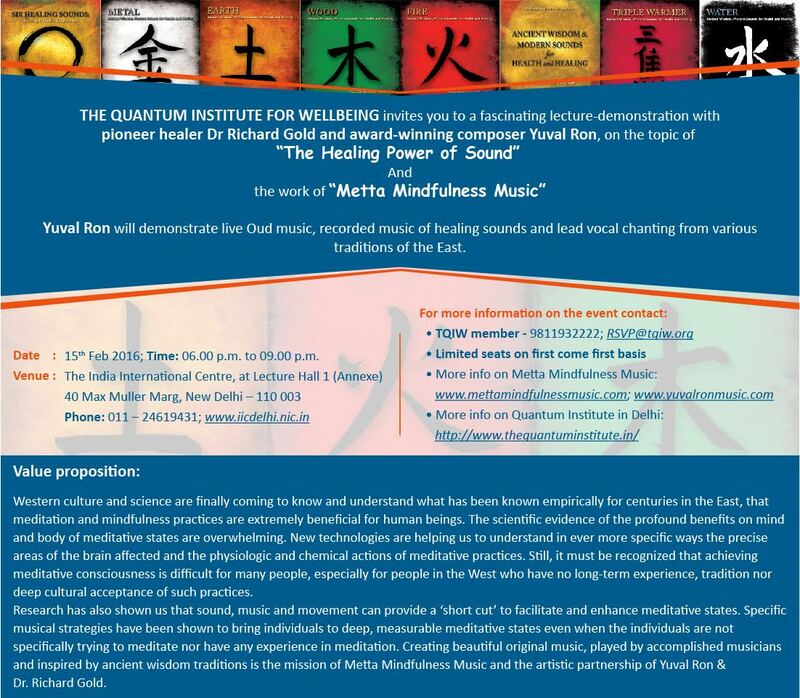 Utilizing the ancient wisdom traditions of India & China along with modern scientific understanding of sound & neuroscience , Dr. Richard Gold and award-winning composer and performer Yuval Ron will present a lecture, demonstration and audience participation event hosted by The Quantum Institute for Wellbeing(TQIW). The event will be enhanced by a live musical performance of Yuval Ron on the Oud (a middle Eastern lute). Dr. Gold will lead the attendees in the Six Healing Sounds Qi Gong (Liu Zi Jue (六字訣) ) and Aum chanting for the three Doshas. Additionally, Dr. Gold will describe the research being sponsored by Metta Mindfulness Music on the measurable effects of the Six Healing Sounds on the bio-energy of human subjects. Please mention that Yuval Ron invited you to attend as his special guest. The event will take place on Feb 15, at 06.00 p.m. to 09.00 p.m. Please do not be late. Telephone Number: 011 – 24619431, website –www.iicdelhi.nic.in. Western culture and science is finally coming to know and understand what has been known empirically for centuries in the East, that meditation and mindfulness practices are extremely beneficial for human beings. The scientific evidence of the profound benefits on mind and body of meditative states is overwhelming. New technologies are helping us to understand in ever more specific ways the precise areas of the brain affected and the physiologic and chemical actions of meditative practices. Still, it must be recognized that achieving meditative consciousness is difficult for many people, especially for people in the West who have no long-term experience, tradition nor deep cultural acceptance of such practices. Research has also shown us that sound, music and movement can provide a ‘short cut’ to facilitate and enhance meditative states. Specific musical strategies have been shown to bring individuals to deep, measurable meditative states even when the individuals are not specifically trying to meditate nor have any experience in meditation. Creating beautiful original music, played by accomplished musicians and inspired by ancient wisdom traditions is the mission of Metta Mindfulness Music and the artistic partnership of Yuval Ron & Dr. Richard Gold.